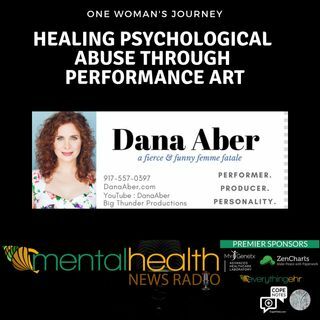 Dana Aber joins our host to talk about how she has used performance art to help heal from narcissistic abuse. Her performances have become about letting anyone know who has been there - they aren't alone. Dana Aber is a performer, producer, collaborator, and creator. Her career in New York City has flung her across the seas to the Edinburgh Fringe Festival and Thailand, around the oceans on cruise ships, and all through the US on touring shows and with her own productions. She has been ... See More seen in NYC Off-Broadway, at the NYFringe Festival, NYMF, Apollo Theatre, Theatre Row, FDCAC/Classical Theatre of Harlem, and The Dixon Place. Passionate about the development of new musicals, she has been involved with multiple presentations at New Dramatists, Feinstein's 54 Below, NYU’s Graduate Musical Theatre Writing Program, Dramatists Guild, and Ars Nova. Through her Big Thunder Productions company, Dana has created and helmed 8 concert-cabarets with upwards of 50 contributing musical collaborators, showcasing over 85 performing artists, most notably the bi-coastal #YesAllWomen Raise Your Voice concert that linked artists across the country to the movement for gender equality. Her collaboratively built solo show, Baggage at the Door, explores her synesthesia-soaked healing process from trauma through original songs and video projections. She is a survivor and advocate, and is honored to be able to use her voice to share for those who cannot. She is also a part of the www.healmetoofest.com.